A rabbit is not a “bunny” but need to be viewed as a high protein, niche market product that offers opportunities for new farmers with limited access to land under intensive farming conditions. Previous attempts in South Africa at producing rabbit meat as a cheap protein has failed due to the costs involved in production. In Europe rabbit meat is sought after and an everyday meat in most homes. The export market is available, but need high volumes to be able to supply the demand. For a while now the UTA has engaged with knowledge basis to develop a production and financial model that can be offered to new farmers, but that has sufficient protection, mentorship, marketing opportunities, breeding stock and resources to support out growers. In May 2015, Casidra Chief Executive Officer (CEO), Chief Operations Officer (COO) and the Unit for Technical Assistance (UTA) attended an event organised by Lathitha Ingomso Yethu Rabbit Farms (Pty) Ltd in conjunction with Coniglio Farm. The objective of the site visit, according to the programme was to ensure that all key stakeholders in the development of the Rabbit Farming for Smallholder Farmer Development Programme (RF4ShFd) were provided with an opportunity to review the rabbit farming operation. Stakeholders were able to assess the infrastructure required and engage in a discussion of the market potential of Rabbit Meat. Rabbit farming in South Africa and in the Western Cape especially is still scattered. It is still viewed as niche market farming and not done on an intensive scale. What makes it difficult for the current rabbit farmer is the non-availability of production and market information on rabbits. This, it would seem, was the intention of the farm visit, thus to indicate that these issues were known and measures were being put into place to make rabbit farming more attractive. Coniglio has developed a local and export market and production techniques and is now opening the opportunities to other growers to supply their rising market demand. The above mentioned problems lead to another very important question; why rabbit farming? Rabbit meat has the highest protein content of all meats. Protein is important for healthy cellular processes and functions that in turn support tissue development, repair, and maintenance. Rabbit has the lowest fat content in the meat as compared to other meats. In addition, 63% of rabbit meat’s fat is unsaturated fat, which is regarded as the good fat. The case for rabbit meat is compounded when you consider the fact that there is always a deficit in supply of chicken such that chicken has to be imported from Brazil to meet local demand. Other than the aforementioned health benefits, the rabbit business itself is financially profitable when high standards are maintained in the rabbitry, which results in high meat quality being produced. 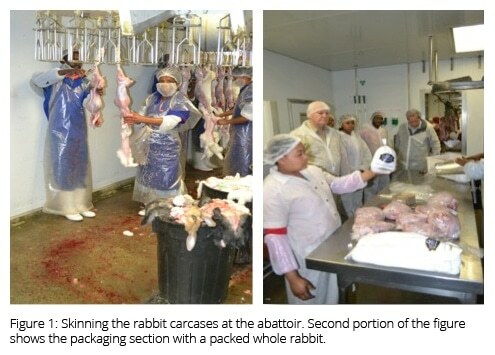 The biggest problem that Rabbit farmers or aspiring rabbit farmers would face in the Western Cape is the abattoir. In the Western Cape, there is only one abattoir currently that slaughters Rabbits. This abattoir is also an export certified abattoir that is located in Joostenberg Vlakte, Kraafontein. It is not a specialist rabbit abattoir, but rather a Duck abattoir, which can also be used to slaughter export quality rabbits. During the site visit, Casidra’s CEO Michael Brinkhuis also doubled as an enthusiastic camera man. Figure 1 below shows the activities in the abattoir. The abattoir in Figure 1 above used to be the only abattoir in the country and rabbits from all over the country had to be transported to this abattoir to be slaughtered. The capacity for slaughtering is currently 300 rabbits a day. The rest of the capacity is dedicated to the slaughter of Ducks for export. Rabbit slaughter is restricted to 3 days per week. However, another abattoir has been constructed in Gauteng which has reduced the number of rabbits that get transported from other provinces to be slaughtered at this abattoir. a. Rabbit meat is more expensive than Chicken meat. For it to penetrate the general populace as a chicken substitute, the going price will have to be competitive and comparative with that of Chicken. It is not accessible on the open market. If rabbit meat were to be accessible to the general and be supplied in larger quantities, the going price due to high supply would have reduced the overall price of rabbit meat, thereby, making the general populace have access and be able to afford rabbit meat. To overcome the above problems, a number of marketing avenues are being explored. 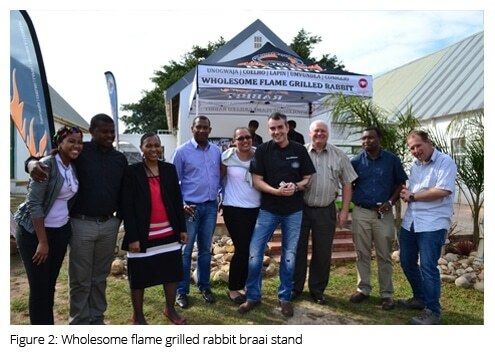 Rabbit farming companies like Coniglio have established permanent and mobile rabbit meat stands in places like Nyanga where roasted (braai) rabbit meat can be bought. Figure 2 above shows such a facility. 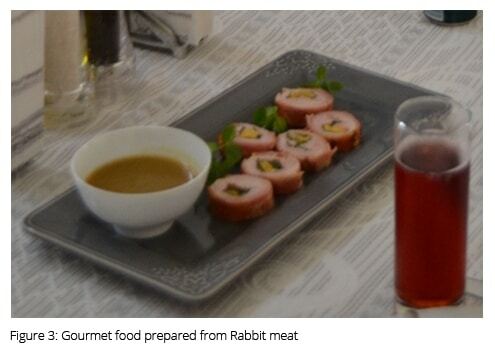 As can be seen in Figure 3, rabbit meat is being incorporated into gourmet food preparation. What would be the establishment and cost implications of small scale rabbit farming? Environmental Impact Assessment will only be triggered if a Rabbitry goes beyond 500 rabbits per facility and/less having less than 3m2 space per rabbit. Coniglio is the only off-taker in the Western Cape Province. They also offer assistance to startup rabbit farmers with cages, feed, training, and Windows Tablet software to run the business effectively. At the moment, the company has capacity to off-take all rabbits in the province.